1 Steyr MO114 109 pk. Atlantic 5 is an aluminium sailing yacht with lifting keel and two rudders. 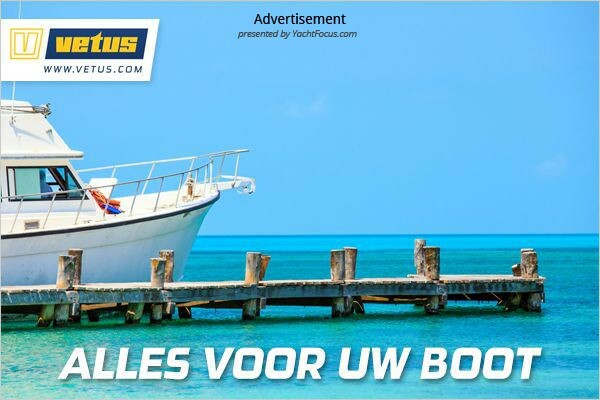 Meer informatie over dit zeilschip is te vinden in de brochure. Jefa double steering system in the cockpit with two single spoke stainless steel steering wheels with leather cover. One compass at each steering wheel. Electrical/hydraulic system with double working stainless steel cylinder, 2kW generator and separate manual back-up system. The keel system can be managed through control switches from the steering area. Shower cabin with stainless steel basin, mixing tap with shower and hose. Toilet room has stainless steel basin, mixing tap, Lavac vacuum toilet with Hendersen pump. Blackwater tank for toilet installed. Greywater tank with build in automatic float switch and Whale Gulper 22 electrical discharge pump, for all waste water comming from the shower tray and basins. Automatic waterpressure pump, 24 volt. Mast by Hall Spars: profile 1264 + (303x164) tapered aluminium mastsection, lenght 21.45m. AWLgrip white coating mast. Welded-in masthead with aluminium sheaves for in-mast main halyard, boomlift and two Yankee/Genoa halyards. Two cranes with U-bolts for attachment of blocks for spinnakerhalyard. Aluminium crane with stainless steel bushings for attachment of backstay toggle and aluminium fitting with stainless steel bushings for attachement of headstay toggle. Backing plates installed for attachment of capschrouds, intermediates, lower schrouds and babystay. Tangs for attachement of check stays. Three sets of tapered aluminium spreaders. The lower spreaders with strap eyes for attachment of burgee lines. PVC conduit installed up to the masthead to protect wires, including pilot line and cables for navigation lights. PVC conduit installed at front of the mast, including cables for lights and pilot lines for installation of radar cable and antenna cables. Aluminium cable exit installed at front of the mast. All halyard exits to include stainless steel chafepads. Insulated hard anodized aluminium mast heel with rocker to suit mast step fitting and rake angle. - Spinlock twin halyard stopper for yankee- and staysail halyard. - Frederiksen Full Batten System mounted on the mast. Profile 8758 (221x145). E= 6.05m. Frederiksen serie outhaultrack + outhaulcar with slide rods. Headstay, backstay (upper part with custom wireblock), capschrouds and lower shrouds, 12mm wire 1 x 19 with rigging screws and studs. Innerstay, babystay and intermediates, 10mm wire 1 x 19 with rigging screws and studs. fits onto Furlex 300S furling system.